Each year people are eagerly looking to clean out their closets in preparation for the upcoming winter. 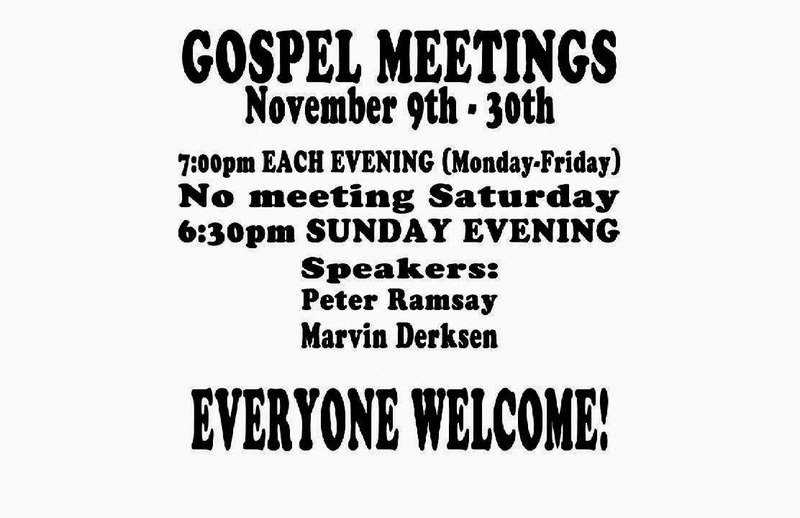 We decided this year, with a gospel supper scheduled the next day, and a series of special Gospel meetings starting the following week, we would take what people are willing to give away and use it to make contacts with the community surrounding the Gospel Hall. In addition, we used this time to invite people to our Community Dinner held on the first Sunday of every month. In preparation for the Giveaway we distributed approximately 800 invitations to the surrounding community, which were double sided and had an invitation to the upcoming special gospel meetings. We distributed these via Canada Post a week before the Giveaway was scheduled. We also had people share an electronic copy of the invitation through social media. We were blessed with about 400 additional invitations being printed at no charge which were also distributed to two other areas of Moncton. Individual invitations were also given to friends and family who were in need. 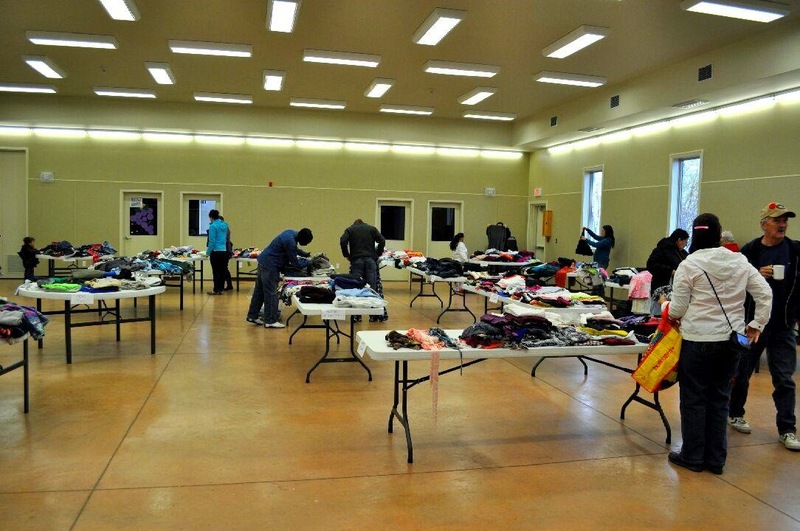 The clothes were provided this year from the Christians only, however we had a number of others who asked next year if we would be taking donations. 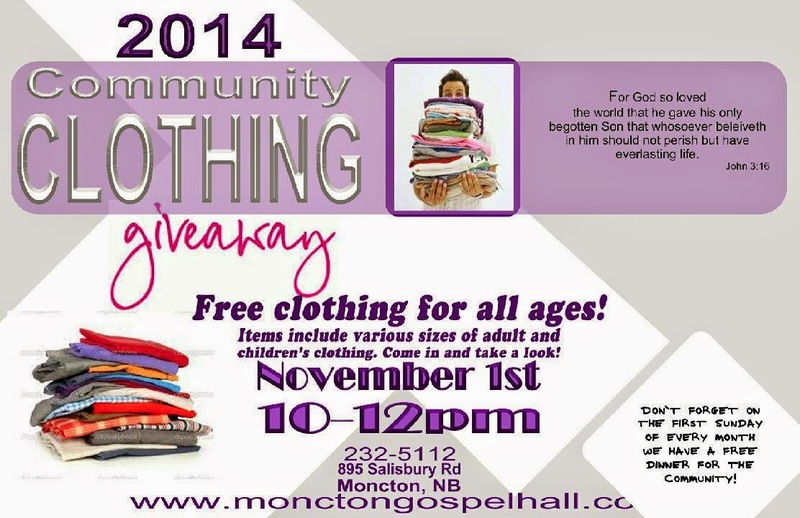 The Clothing Giveaway started at 10am and lasted two hours. There was a steady stream of people who attended as well as a good mix of ages ranging from children to seniors. All were very happy to have this being offered in their community. We took every opportunity to give invitations to the Gospel suppers as well as the upcoming meetings and people were very open to taking what we had to offer. We also offered Bibles to everyone who wanted one. We had three families come and one fellow who was in Canada for the first time from Africa. We provided coffee and tea, which gave the saints an additional opportunity to mingle and connect with people. Overall this day was a huge success as thirty people of the thirty five who showed up had never set foot in the building before. These people came to get clothes and took the literature we offered. We gave out seventeen Bibles and had an opportunity to connect personally with everyone. The next day a mother and her daughter who came to the clothing giveaway attended the community dinner for the first time and stayed to hear the gospel after. Three other families that attended have been invited to bring their children to Sunday school. Many Christians participated in the preparation of this event - as well as the day of the event and this was a huge encouragement. The Christians were very united in this work and the results speak for themselves. If I could offer some encouragement to anyone looking to take on this kind of event it would be to pray for the Lord to help and get other people involved early. Do what you can do, let others do what they can do, then the Lord will do what we cannot do. Follow the pattern given in John 5 in the feeding of the 5000.